Hon. 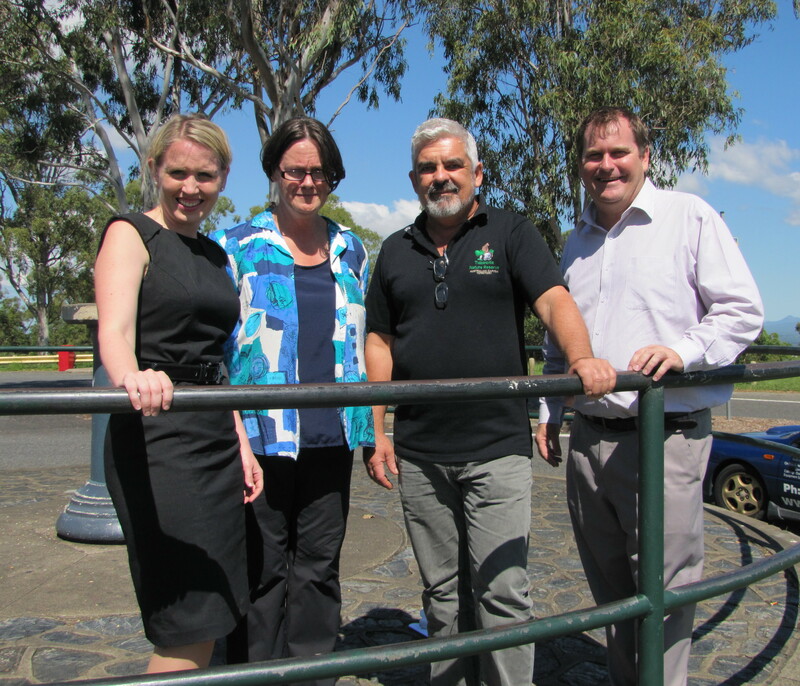 Kate Jones, Minister for Environment and Resource Management joined us today at the Summit of Mt Gravatt to share our vision for restoration of this special part of our community. Phil Reeves, local member and Minister for Child Safety and Minister for Sport joined myself and butterfly expert Helen Schwencke of Earthling Enterprises, hosted our Environment Minister. Like most visitors Minister Jones was blown away by the beauty of the mountain which recalled her days of walking the eastern slopes of Mt Cootha as a child. Our discussion covered everything from public toilets at the Summit, to habitat consolidation and wildlife corridors linking the Reserve with Mimosa Creek Precinct and Roly Chapman Reserve. The Minister asked about Koala sightings: Fox Gully and Rover Street Bushcare sites, also behind houses in Mountain Street. Also discussed were the species diversity with Echidnas and two hundred and fifty-four native plant species, as well as, the need for nest boxes to support Squirrel & Sugar Gliders in a forest with only a small proportion trees over one hundred years old. The reality of flood recovery priorities means that government funds, for bushland restoration in the Reserve, will be limited in the short-term. However, Mt Gravatt Environment Group is currently revising our five-year Strategic Plan, so it was encouraging and valuable to be able to brief the Minister on our vision and plans for the Mountain habitat. The Minister was particularly impressed with our efforts to build relationships with Griffith University and corporate sponsors like ANZ Bank, which will help with some short-term projects.